HamiltonJet New Zealand is dedicated to small jetboat manufacture for the New Zealand domestic market, and sales and support of HamiltonJet waterjet propulsion units in New Zealand and the Pacific Islands. All enquiries outside of New Zealand or the Pacific Islands should refer to the main HamiltonJet website and Contacts Page. The popular HamiltonJet 151 has undergone a makeover of both hull and deck to enhance the proven performance features of this great family jet boat. Reduced hull height and topside running parallel with the gunwales have given the 151 a sleek new side profile that is sure to turn heads on the river and at lake-side. Below the chines the 151 hull bottom has been subtly reshaped to generate extra lift and create a finer bow entry line, lowering the trim for easy hole-shot and shallow water performance without adversely affecting bow wetting at high speed. A non-skid step has been incorporated into the dash to make it easier to get in and out of the boat from the front deck, and avoid standing on the front seats. Also the top of the dash has a shallow tray added for convenient storage of sunglasses, fishing lures etc. The fibreglass deck is available in any number of gelcoat colour options, from a single colour throughout to the standard HamiltonJet inserts in a second colour. Seat and engine cover upholstery is custom made to match hull and deck colouring, and we work closely with all suppliers to ensure colour coordination is to your own exacting standards. HamiltonJet decks are now manufactured locally to the highest standards of construction and finish. All HamiltonJet products are backed by our hard-earned reputation for the highest quality of materials and workmanship, and supported by our experienced team of jet boat and waterjet specialists. 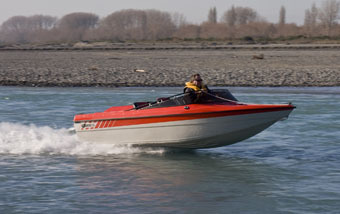 Call or email us to arrange a demo drive of the new HamiltonJet 151 at the Waimakariri River, the Rakaia River or Lake Hood, Ashburton.